Type of values manipulated by the IntervalSemantics domain. Definition at line 37 of file IntervalSemantics2.h. Definition at line 71 of file IntervalSemantics2.h. Instantiate a new data-flow-bottom value of specified width. Definition at line 76 of file IntervalSemantics2.h. Instantiate a new undefined value of particular width. Currently, there is no distinction between an unspecified value, an undefined value, and an interval that can represent any value of the specified size. Definition at line 84 of file IntervalSemantics2.h. Instantiate a new unspecified value of specific width. Definition at line 92 of file IntervalSemantics2.h. Instantiate a new concrete value of particular width. Definition at line 97 of file IntervalSemantics2.h. Instantiate a new value from a set of intervals. Definition at line 102 of file IntervalSemantics2.h. Instantiate a new value that's constrained to be between two unsigned values, inclusive. Definition at line 107 of file IntervalSemantics2.h. Instantiate a new copy of an existing value. Definition at line 112 of file IntervalSemantics2.h. Create a value from a set of possible bits. Promote a base value to an IntevalSemantics value. The value v must have an IntervalSemantics::SValue dynamic type. Definition at line 120 of file IntervalSemantics2.h. 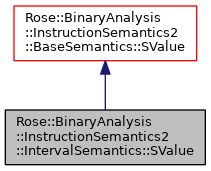 Referenced by Rose::BinaryAnalysis::InstructionSemantics2::IntervalSemantics::RiscOperators::svalue_from_bits(), and Rose::BinaryAnalysis::InstructionSemantics2::IntervalSemantics::RiscOperators::svalue_from_intervals(). Definition at line 129 of file IntervalSemantics2.h. Definition at line 132 of file IntervalSemantics2.h. Definition at line 135 of file IntervalSemantics2.h. Definition at line 139 of file IntervalSemantics2.h. Definition at line 142 of file IntervalSemantics2.h. Construct a ValueType that's constrained to be between two unsigned values, inclusive. Definition at line 157 of file IntervalSemantics2.h. Construct a ValueType from a rangemap. Note that this does not truncate the rangemap to contain only values that would be possible for the ValueType size–see unsignedExtend() for that. Definition at line 163 of file IntervalSemantics2.h. Given the set of bits that could be set, generate a range. We have to be careful here because we could end up generating very large rangemaps: a rangemap where the high 31 bits could be set but the zero bit must be cleared would create a rangemap with 2^31 singleton entries. Definition at line 170 of file IntervalSemantics2.h. Definition at line 183 of file IntervalSemantics2.h. Definition at line 187 of file IntervalSemantics2.h. Definition at line 191 of file IntervalSemantics2.h. References Sawyer::Container::IntervalSet< I >::least(), and Sawyer::Container::IntervalSet< I >::size(). Returns the rangemap stored in this value. Definition at line 202 of file IntervalSemantics2.h. Changes the rangemap stored in the value. Definition at line 207 of file IntervalSemantics2.h. Returns all possible bits that could be set.